Dental health is a key component of our pet’s health and should be regularly monitored by both owners and veterinarians. Dental disease affects the majority of animals over the age of 3 years old. Your veterinarian can help you decide how often your pet needs a dental cleaning, and if need be, extract teeth that are no longer healthy. The earlier dental disease is detected, the sooner your pet gets back to having a happy healthy mouth. 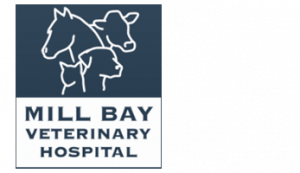 At Mill Bay Veterinary Hospital, we offer comprehensive dental cleanings, using our ultrasonic scaler, hand scalers, and polisher. These instruments remove tartar and calculus above and below the gum line and then smooth the surface of the teeth making it is harder for tartar to build up again. Our veterinarians are trained to remove any teeth that are no longer healthy, due to fractures, gingival recession, mobility, etc. We also offer dental radiology to identify any issues that cannot be seen at or above the gum line. Signs of dental disease may include bad breath, decreased food consumption, jaw chattering, and in some cases, the animal becomes head shy. Feline tooth resorption happens around the bottom of the crown of a tooth when the tooth loses its integrity and the pulp cavity becomes exposed. The pulp cavity of a tooth is where the nerves and blood vessels are. When the pulp is open, it is quite painful, and the tooth needs to be removed.